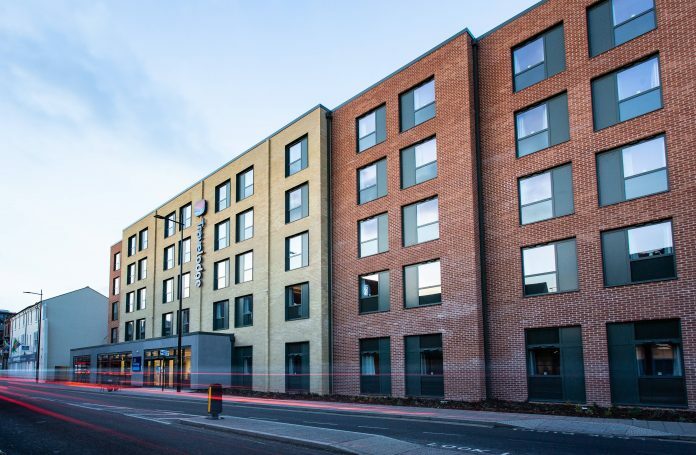 A York based property development company has completed and handed over a new 127 bedroom, five-storey hotel in the heart of Lincoln ahead of schedule and within budget. S Harrison has developed the site, which is just off Tentercroft Street and close to the new £30 million transport hub project in Lincoln city centre, and contracted family-run firm R G Carter to carry out the construction work which started last November. Earlier this year S Harrison sold the hotel, which will be operated by Travelodge Hotels Limited on a 25-year lease, to the City of Lincoln Council for £13m. Andrew Wharton, from S Harrison, said: “This hotel is an exceptional and high-quality building that has completed two weeks ahead of schedule thanks to our close working relationship with R G Carter. “It’s located in a bustling part of the city and the top floors offer great views of Lincoln Cathedral, so there’s no doubt it will be a welcome addition to Lincoln’s supply of hotel rooms that will be popular with both tourists and business travellers alike. The new Travelodge has 127 bedrooms and 22 dedicated car parking spaces. Mainly constructed from red and buff brickwork with recessed grey aluminium window frames, the ground floor of the hotel incorporates a reception, breakfast area, café, bar, seating area, kitchens and storage areas.